Residential - Move-in ready Lindsay bungalow in a beautiful residential neighbourhood. This home has 3 bedrooms, 2 full baths including ensuite plus a convenient 3 pc bath with shower in basement. This home is well laid out for family living. Upstairs you will find an eat-in kitchen, dining room/living room combo, and bedrooms. Downstairs is ready for your creativity, with a possible bedroom or two. Attached oversized two car heated garage. Outside you will find a well treed property lot with large deck and you will appreciate the power awning. Interlock lifetime warranty fully transferable over 50 years. What a wonderful place to call your home conveniently located in Lindsay. Don`t wait on this one! Happy Monday! I hope you had an awesome weekend and are ready for a BIG week! As always, I like to start the week off right with some words of inspiration….. I was online this weekend, saw this photo and wanted to share in hopes it helps inspire you as it did me….. So often we say to ourselves "Oh once I have x I will start doing……" . What happens when we use that type of language is we never get started and then never accomplish what we know we truly want. Instead start NOW… start where you are with what you have! It boils down to truly just being a limited belief that paralyzes us from taking action and going after what we truly want…. Don't wait… Start Now! Happy Monday! I hope you had an amazing weekend! As always I like to start the week off right with some words of motivation! Today is Monday... most view this as a negative thing... as 5 work days to get through so they can enjoy the weekend... Don't fall into this mindset... Instead think of today as the start of a new week for you to create an amazing week... to start taking action on your goals and dreams... to get one step closer to creating the life you want and deserve! It is Monday, Don't Forget To Be Awesome! A large group of us booked the weekend at Edgewater Park in Kearney Ontario. This cottage resort is on Sand Lake. It took about 3 hours to get there from Peterborough. Enjoy the pictures! Conveniently located north end home that is completely move-in ready. This home has been loved and ready to be passed on to a new owner. Here you will find a good sized city lot for your children or pets, large deck, and landscaped property. Nothing overlooked. You will find the hardwood floors have been completely refinished, renovated bathroom, renovated kitchen, modern colours throughout, new central air conditioning, new dishwasher, and even a new front steel door. Shingles, breaker panel, windows, and furnace all in excellent shape. Nothing has been missed and ready to go. Well it more than likely may have been you just tried the wrong plan…. 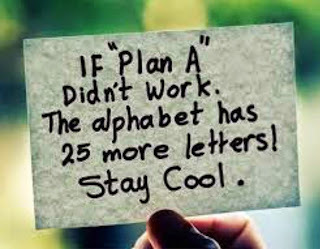 -If "PLAN A" Didn't Work. The Alphabet has 25 more letters! Stay Cool…. Anyone that is successful has failed WAY more times than succeeded… The secret…. never stop trying… never give up and always keep pushing!